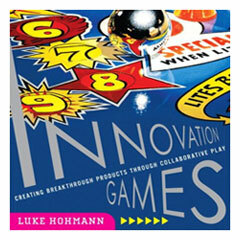 Six months ago I was contacted by the publisher Addison-Wesley and invited to review a manuscript for a book called Innovation Games by Luke Hohmann. I just noticed they’re now accepting pre-orders on Amazon. While I’m still bound by the the review agreement and restricted from discussing particulars of the book, I can give a general overview and say that this will be an important work for anyone who strives to elicit the purest feedback and forward-thinking suggestions on the development of a product/service. First let’s look at the problem Luke is addressing. Anyone who has conducted a focus group or a psych experiment knows that as soon as you ask someone for a justification of a decision, the mere act of asking them to explain things can cause them to change their response to fit the justification they think you want. Malcolm Gladwell covered this phenomenon in depth in his book Blink and perhaps the most memorable he cites is the experiment where a bunch of college students were offered a selection of posters for their dorm at the beginning of the year. The only condition of the experiment is that they had to keep the poster on their wall for the rest of the semester. Most of the students ended up choosing abstract art pieces (almost none chose the cutesy “kitten with a ball of yarn”-type posters you see in doctor’s offices). The experiment was repeated with a new group only the next time around the students had to justify their decision for the poster they chose. A great majority of the students ended up picking one of those rainbow, kitten, motivational posters and attributing their choice to the “cuteness” of the poster. The funny thing is a satisfaction survey conducted at the end of the semester showed that nearly all the students from the second group that had chosen the kitten posters HATED their poster and most had taken it down while the students that had never been required to justify their choice were still content with their selection. So how does this relate to Innovation Games? It makes the solicitation of the feedback implicit rather than explicit therefore nullifying the Hawthorne Effect (*note the Hawthorne Effect has been contested and yet continues to manifest primarily in educational experiments). It makes the experiment itself a more pleasurable activity and therefore improves the likelihood that participants will actively contribute as much as possible. It encourages creative thinking and produces interesting artifacts that can be analyzed and quantified later rather than bottle-necking the available responses up front to multiple-choice questions on a survey. I recommend this book to anyone that has the task of conducting a focus group for his or her company and for anyone with access to potential customers who would benefit by innovating around an existing product or service. My only criticism of this book is that after reading about how to conduct all twelve games, it was difficult to remember individual games later and when it was appropriate to use each. I lobbied for Luke to produce a supplementary DVD that showed concrete examples of past games conducted at his seminars with the thought that doing so would help cement the abstract ideas with real imagery and therefore facilitate better recall of each. I do not know whether they plan to release such a DVD but hopefully they will at some point. It’s not critical that you remember the specifics of the games from memory (you can always reference the book) – it’s more important that you understand the relevance of each game and be able to identify situations when it would make sense to employ a game to extract meaningful insight. You can read more from Luke on his blog or via his company’s website. It should be noted have no affiliation with Luke or his company. I received a small, one-time honorarium from Addison-Wesley for reviewing the manuscript but I realize no future financial gain from the success of his book. UPDATE 5/8/07: Full disclosure: I do now have an affiliation with Enthiosys, Inc in that I am now a certified Innovation Games facilitator and qualified to deliver the games. UPDATE 8/30/07: Big thanks to Bridgitte Kaltenbacher for pointing out that the reference doesn’t actually appear in Blink. I mistakenly attributed it to his book but it actually appears in his talk at Poptech a few years back. That MP3 can be found here and the reference starts around 23:10. In the new Innovation Games site wWe’re going to be providing a link to this review of the book. I was wondering if you could update your blos post with the new and improved cover art which can be found on the amazon site you link to.